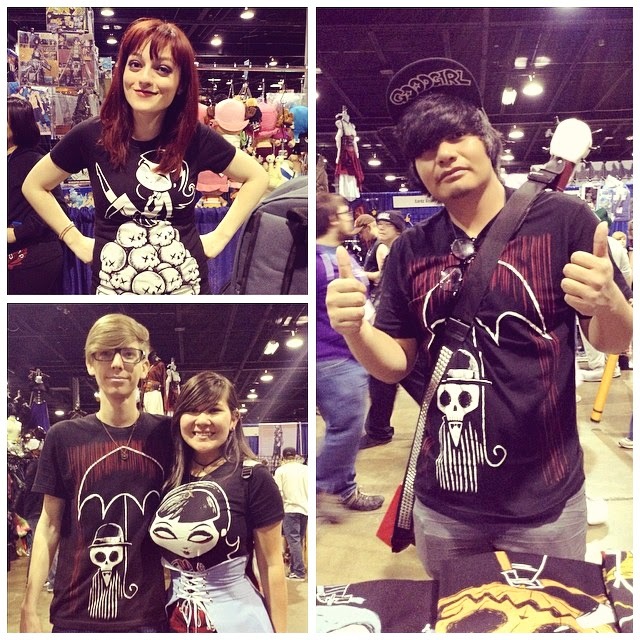 This weekend was our first time going to Illinois since the inception of Akumu Ink in 2008. This being the case, we were surprised to see how many people knew about us from magazine features, social media, and local stores carrying our gear. Aside from all those of you that knew about us already there was a bunch of 'creepers' that knew about us and followed us on our different social media sites (which we also loved! ), and of course many of you that never heard about us and are now hooked! Never having been to Illinois, we didn't know what to expect, but my mind was blown with the amount of love and acceptance for our brand. I have never been so inspired to work on new designs as I have been after this weekend. Everyone we met was so polite and sweet that it really humbled me. Aldora and I are so happy that you get what we're doing and that you are allowing us to continue to create fun, cute, creepy art for you. We'll be back this year for Wizard World Chicago (August 21-24), but in either case we'll be back for Anime Central in 2015. If you didn't get a chance to pick something up at the show, it's either currently online or will be released within the next 6 months. Follow us on facebook and instagram to see when it becomes available. Don't wait to pick up something next year at the con that you saw this year, as it will most likely no longer be available by then. Thanks Illinois!